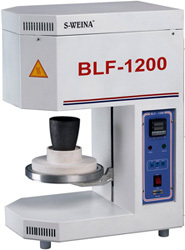 Compact Bottom Loading Lab Furnace for 1200oC ideal for R & D application & ceramic industries like Dis integration, Test & Analysis of Advance Ceramic Sample, Glass melting, Refractory porosity, Long term temperature test, Firing & Sintering, Semi conductor Industries for Annealing silicon, Silicon carbide & Nitride samples. Furnace have electrically operated elevator for ease of loading / unloading operation furnace uses latest medium wave infrared technology controlled by Micro Processor Based, fuzzy logic PID control with programmable profile for 2 Pattern of 8 Step each for programming rate of Temp rise & hold time (Ramp / Soak), RS-232 Communication port is provided for on-line monitoring / controlling & Data logging with software provided, multiple using can be monitor using same software ( upto 30 diff. Furncacesmodbus RS-485 interface in place of RS-232 fully insulated for Electrical & Heat. Power : 230 VAC + 10% 50 Hz, 2000W. Option : Inert Gas / Vaccum Atmosphere 1400oC & 1800oC Range. 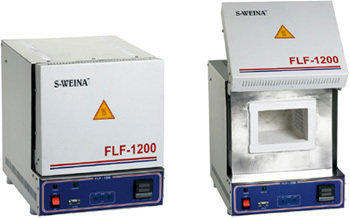 Compact Lab Furnace specially developed for R&D usage for Sampling & Testing using vaccume or insert atmosphere suitable for 1200oC, using latest medium wave infrared technlogy controlled by Micro Processor Based, fuzzy logic PID controller with programmable profile for 2 Pattern of 8 Step each for programming rate of Temp rise & hold time (Ramp / Soak), RS-232 Communication port is provided for on-line monitoring / controlling & Data logging with software Provided, multiple units can be monitor using same software (upto 30 diff. Furncaces using modbus RS-485 interface in place of RS-232) fully insulated for Electrical & Heat. 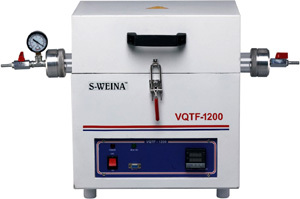 Power : 230 VAC + 10%, 50 Hz, 2000W. 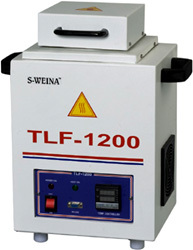 Compact Top Loading Lab Furnace suitable for melting application using Graphite Crucible for 1200oC Ideal for R&D, Glass Industries, Jwellery industries. Furnace uses high temp. heating elements controlled by Micro Processor Based, fuzzy logic PID controller with programmable profile for 2 Pattern of 8 Step each for programming rate of Temp rise & hold time (Ramp / Soak), RS-232 Communication port is provided for on-line monitoring / controlling & Data logging with software provided, multiple units can be monitor using same software (upto 30 diff. Furncaces using modbus / RS-485 interface in place of RS-232) fully insulated for Electrical & Heat. Compact front loading Lab Furnace suitable for 1200oC using latest medium wave infrared technology controlled by Micro Processor Based, fuzzy logic PID controller with programmable profile for 2 Pattern of 8 Step each for programming rate of Temp rise & hold time (Ramp / Soak), RS-232 Communication port is provided for on-line monitoring / controlling & Data logging with software provided, multiple units can be monitor using same software (upto 30 diff. Furncaces using modbus RS-485 interface in place of RS-232) fully insulated for Electrical & Heat. Electrically operated front door for opening / closing for ease of putting & removing jobs.